Christmas is just around the corner, and with the launch of the Stella Artois Christmas campaign, we have been provided with a poignant message for the holiday season. Stella Artois’ out-of-home campaign titled “Give Beautifully” focuses on thoughtful gift-giving whilst reminding viewers of the importance of responsible drinking throughout. Stella Artois will also be publishing a series of personal short films on its YouTube channel and Facebook pages throughout advent to illustrate the importance of savouring good gifts. 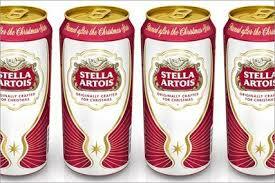 To complement the ‘Give Beautifully’ campaign, Stella Artois has produced a variety of limited edition packages. A 6 x 330ml pack will be available which will include a 330ml Chalice for festivedrinkers to enjoy a pint of Stella Artois at home. Special Christmas packaging will also be used for 440ml and 568ml cans and the 330ml and 284ml bottles. Many drinking establishments around the country will also be serving Stella Artois in the limited edition snowflake Chalices. Get hold of your own Chalice directly from the Stella Artois Online Store!